The first reviews of Qualcomm and Microsoft's Snapdragon 835-powered laptops and tablets are in, and they're mixed to say the least. So as to stem the tide, Qualcomm has released a series of video advertisements that tout these devices' purported benefits. However, said video ads tend to dance around the discrepancies between what reviewers have found during testing and what Qualcomm has claimed about its newfangled Windows 10 laptops and tablets running on its smartphone and tablet processor. Particularly, what reviewers have found in terms of performance and longevity don't sync up with the chip maker's promises. 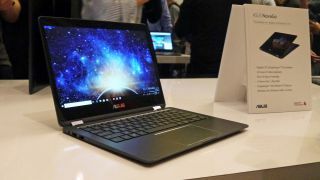 For the record, CNET, Laptop and PCMag have found the Asus NovaGo 2-in-1 laptop, with a Snapdragon 835 processor inside, to exhibit excellent, 12-hour-plus battery life – however, neither Laptop's nor PCMag's figures total up to Qualcomm's promised 22 hours of use on a single charge (see below). The battery life of a device in real-world testing not adding up to a manufacturer's promise has been a reality for too long in technology reviews, it should be noted. However, differences of several hours are enough to raise eyebrows, not to mention those regarding hard performance. On a related note, both Laptop and CNET have found this laptop to lag behind some similarly-priced competitors – with Intel Core U series chips inside – in benchmarks like Geekbench 4. However, Qualcomm's video ad regarding performance displays its laptop outperforming an Intel-based competitor while keeping device temperatures down (seen below). Of course, it's impossible to tell exactly what competitor device is shown here, but it sure doesn't add up to what these outlets have found in their performance comparisons. Though, it should be noted that these reviews don't account much for temperature. While it's important to keep in mind that the Asus NovaGo will cost a digestible $599 (about £421, AU$774) when it releases this May, there are other devices with this hardware inside that will end up costing more than that, like $999 (about £703, AU$1,292) for the HP Envy x2 and $799 (about £562, AU$1,033) for the Lenovo Miix 630. Clearly, Qualcomm's looking to amplify its story regarding the benefits of these devices in the face of some lukewarm to poor reviews of the Asus NovaGo. We've not yet been able to review the first Qualcomm Snapdragon laptops and Windows 10 tablets, but are certainly on the case. Keep it locked here for those reviews before you buy, as the claims around these devices from both sides are certainly contentious.